Ken, Joe, and Akira, three high school students, must combine their three mecha into Gekiganger III to defeat the evil Prince Akara and Emperor Hyperion. The OAV is a compilation of the scenes from Nadesico, a new "movie", and is a parody of many mecha series from the 80s. 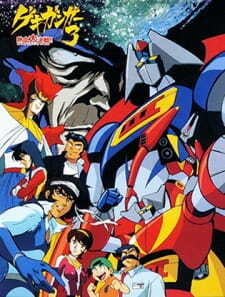 Gekiganger 3, a fictional anime within the Martian Successor Nadesico TV series, is a parody/tribute to old 70s Super Robot shows, like Mazinger Z and Getter Robo. Those are all the basics. I liked it, and if you appreciate old-school Super Robot shows, or like to make fun of the formula and its quirks, this is a nice OVA which can be enjoyed without using up too much of your time. The OVA is quite self-contained, so you don't really need to know about Nadesico in order to understand it. A couple of Nadesico characters are going to see the Gekiganger 3 movie, but they don't really interrupt the action once it begins, which is fair enough. Previous Nadesico knowledge will give you a little bit of extra background info, making it a plus but nothing essential. Before the main feature, a short compilation of episodes from the fictional Gekiganger 3 TV series provides a quick overview of the story so far, what the characters are like and how their world works. Some viewers prefer the compilation to the movie, but I think both work here and, if anything, the movie is a fair representation of what similar projects were like in reality: an excuse to see robots and aliens beat the crap out of each other, without being too concerned about plot holes and continuity issues. The Gekiganger 3 story itself isn't going to win any awards for originality or complexity, but it's not meant to: three passionate young men combine their powers to pilot a giant Super Robot in order to defend the Earth from alien invaders. A timeless formula, whether you take it seriously, like the characters in the show and countless others do, or just want to laugh at the ensuing over the top antics, silly melodrama and mindless hot blooded action. Having a little bit of both perspectives is fine too, of course. Character and mecha designs are intentionally meant to look dated and aren't very impressive (not to mention original) by modern standards, but they definitely give the OVA a nice classic feel. Production values are decent and the animation, while lacking, is relatively smooth at key moments. It has to be said that tolerating a generous use of stock footage is a must, obviously, especially during robot transformation and attack sequences. The music, while somewhat repetitive, is quite good for the Super Robot genre, being mostly energetic but also melodramatic or sad when it needs to. The Gekiganger 3 theme song is actually pretty catchy as well, especially if you like older anime openings. Since this is supposed to be a Super Robot parody/tribute, the characters are directly inspired by the heroes, villains and supporting cast members of genre classics like Mazinger Z and Getter Robo, among others. Many of them are fine archetypes of good and evil, their stories being simple and entirely predictable if you've seen any Super Robot shows before, but still fun to watch in action. Again, you shouldn't expect to see, say, the cast of an ambitious space opera here, and the OVA is far too short to even remotely contemplate it. The Gekiganger 3 OVA can be pretty enjoyable if you're prepared to see something of this nature and don't expect to see a completely different show. If that's the case, then this is a fairly good parody/tribute to a classic genre. If Super Robot shows seem like a bore and older animation is a pain to watch, then this probably isn't going to change your mind.